Tired of your sports medals just taking up space in a shoebox or closet? 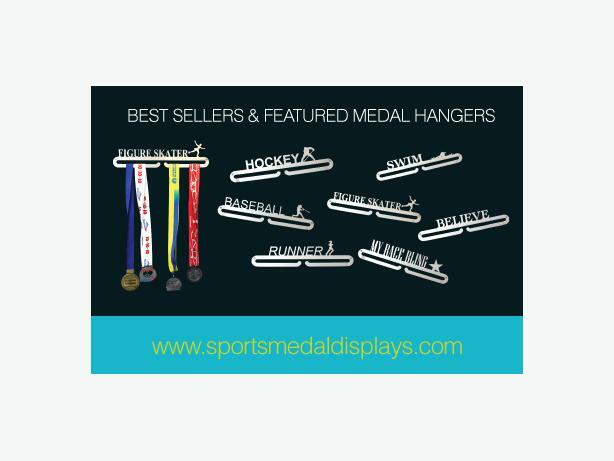 Hang them proudly on a special display rack created by Sports Medal Displays. These aluminum racks come in many sports related designs and hook easily on the wall (attaching devices included). Drape your medals on the rack for a unique display and inspirational boost. Available now: Dancing, Gymnastics, Rowing, Softball, Ringette, Baseball, Marathon, Half Marathon, Ironman, Finisher, Swim, Believe, Rugby, Hockey Goalie, Race Bling, Soccer, Cheer, Figure Skating and others. Check our website for pictures. Fabulous gifts for family and friends!! Most displays in stock and available for shipping within 48 hours.